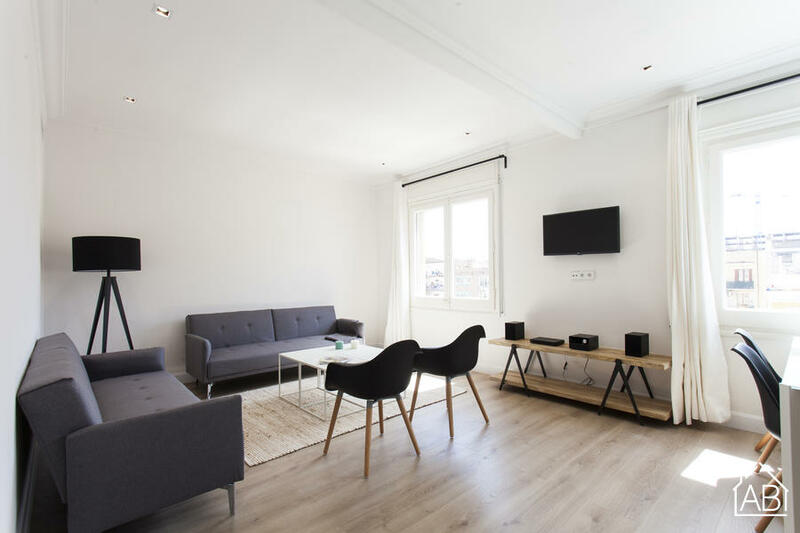 This modern, 200m2 apartment is located in the neighborhood of Eixample. Here you’ll find lots of bars, cafés and places to eat out, as well as plenty of supermarkets. You can easily reach the famous Passeig de Gràcia, Las Ramblas and Plaça de Catalunya via public transport in a matter of minutes, with a metro station on the next block, and the Sants Estació train station is only 10 minutes away on foot. This modern apartment has 4 bedrooms, one with a double bed and three with two single beds in each, making it ideal for large families or friends looking to spend some time in Barcelona. In the living room you’ll find a TV and plenty of seating. The open-plan kitchen has a dining table and breakfast bar, and comes complete with a coffee maker, juicer and kettle. There’s also a washing machine and a dishwasher for your convenience. You’ll have two bathrooms at your disposal, to ensure you have maximum privacy and comfort. What’s more, there is an Internet connection in this spacious apartment, perfect for working, studying or catching up with friends and family. Complete with central heating and air-conditioning, this is a fantastic choice for a group looking for plenty of space in Barcelona.